When it comes to actually stopping a nuclear project, Chinese people seem far more effective than the Japanese. Beijing: China has cancelled the construction of a USD six billion nuclear procession plant in Guangdong province apparently due to public concerns over its safety. The planned nuclear fuel processing project in south China's Guangdong Province has been cancelled, state-run Xinhua news agency reported today. The planned Longwan Industrial Park project under China National Nuclear Corporation, located in Zhishan Township in Heshan City, was cancelled, the report said, quoting officials of municipal government of Jiangmen, which administers Heshan and company sources. The planned industrial park, with a designed capacity of 1,000 tonnes of uranium in 2020, was to feature facilities for uranium conversion, enrichment and manufacturing of nuclear fuel equipment, involving a total investment of 37 billion yuan (USD 6 billion), the report said. The brief report did not mention why the project was cancelled. This is the first nuclear project cancelled by China, which is embarking on a massive expansion of nuclear power projects. Earlier reports said local people had expressed concerns over the safety of the processing plant handling such large quantities of uranium. Public protests which are rare in China are now becoming common specially when it comes to preservation of the environment. Chinese officials also halted the construction of a copper alloy plant in Sichuan province following violent protests by local residents. The cancellation of Guangdong plant also comes in the backdrop of slowing down of the economy which was expected to contract to 7.5 per cent this year from last year's 7.8 per cent, amid reports of a liquidity crunch. Hundreds of people gathered in a city in south China's Guangdong Province on Friday to protest a planned industrial park processing nuclear fuel. Protesters "took a walk" through Jiangmen, holding banners and wearing T-shirts with slogans calling against the planned construction of a nuclear facility in Zhishan Township in Heshan City, which is administered by Jiangmen. According to information published by the government of Jiangmen, the 229-hectare industrial park will feature facilities for uranium conversion, enrichment and manufacturing of nuclear fuel equipment, involving a total investment of 37 billion yuan (6 bln U.S. dollars). Industry insiders told Xinhua that the project is the first industrial park planned in southeast China for nuclear fuel production. It will supply to nuclear power plants in Guangdong and neighboring Fujian Province, with a designed capacity of 1,000 tonnes of uranium in 2020. "We don't need such projects to boost the economy," said a resident surnamed Liu in the crowd of protestors. Liu said he knew little about the nuclear industry but was upset that the planned site was only 30 km away from the city. Wu Yuxiong, mayor of Heshan, said on Friday that the public consultation period for the project, details of which were published on July 4, would be extended. Another official said the construction of the park was "a long way off being started." The city will invite members of the public to tour other nuclear facilities to better understand their production, beef up publicity of relevant scientific knowledge and invite experts from home and abroad into the evaluation of the project, Wu said. The municipal government in Jiangmen, Guangdong announced on Saturday that it would drop a controversial plan to build a uranium processing project in the city. But local residents worried it was just city official's delay tactic to stop them from staging more protests. About 500 people lingered at the city's landmark Donghu Square on Saturday morning after vice mayor Wu Guojie made the announcement at 9 am. Protesters were scheduled to walk from Donghu Sqaure to the municipal government building. "We don't believe the project will be dropped premenently, because our goverent has no credibility at all," one participater said. "The government officials are so corrupt. The accept lots of bribes that could support them to migrant to overseas. That's why they never seriously take care of our living safty," said another resident. Some parents brought their children to Saturday's rally. "I want to use the protest to teach my son and our next generation that nuclear projects wil negatively affact their life and the future development of the Pearl River Delta," a man who brought his 7-year-son to the rally said. The protest was finally cancelled as local government mobolised more than100 police officers and plainclothes policemen who urged protesters to leave. You can read all the posts about groundwater contamination discovery of June-July 2013, at this link. The link is also in the right column of the blog. The entire Japan is too obsessed with the Upper House Election and not many are paying attention enough to appreciate the clever spin that TEPCO's PR puts in the press release. TEPCO dug up a new observation hole, No.1-3, after No.1-2 started to show high tritium and all-beta and No.1 was about to be plugged. The first sample from the new hole was drawn on July 12, 2013, and TEPCO announced the result on July 12. The result of all-beta measurement of the sample from the groundwater observation hole No.1-3 showed about one-tenths of radioactivity compared to the result of the sample from the nearby observation hole No.1-2 (south of the observation hole No.1) from the previous day. WHY DOES TEPCO COMPARE IT TO THE HOLE NO.1-2, whose sample was found with 890,000 Bq/L of all-beta on July 11, 2013? Because the company can then claim the hole No.1-3 had only about one-tenths of all-beta compared to the hole No.1-2. One-tenths, nothing to worry about. All-beta in the sample from the hole No.1-3 is thus 57.5 times as much as that from the hole No.1. TEPCO's PR wouldn't want to emphasize that, would it? It is outright false, as the email notices are about groundwater samples from the observation holes dug in the space between the turbine buildings and seawall, and NOT the seawater, and the measurements are on gamma nuclides, all-beta including strontium, and tritium. Just by looking at the titles, I didn't realize these notices were about groundwater samples along the turbine buildings until one day I followed the link in the TEPCO Nuclear's tweet about groundwater samples. Whatever or wherever it is leaking, it's spreading. Despite TEPCO's attempt to tell us the cesium contamination in the observation hole No.1-2 was from contaminated dirt particles (or other residues), that still doesn't account for higher all-beta and very high tritium. Now, the sample taken from another observation hole, No.3, on July 11 suddenly shows higher all-beta amount. Here's the diagram showing where these holes are located. They are along the seawall, east of the turbine building. In the earlier version of the diagram by TEPCO (6/16/2013), the observation hole No.3 is right near the location where a leak of highly contaminated water from Reactor 3 (remember it is a MOX-fuel reactor) was found on May 11, 2011. How about mixing a small amount of radionuclides that are not present in the reactors in the water to cool the reactors, and seeing if these radionuclides are detected in the observation holes? He withdrew that idea later by saying it may not be a small amount that would be needed. Ocean, the final frontier... for a nuclear power plant. Each 21,000 ton vessel will have two “modified KLT-40 naval propulsion reactors” that will provide up to 70 megawatts of electricity or 300 megawatts of heat, sufficient for a city with a population of 200,000 people. Additionally, the floating NPPs can provide water desalination services capable of supplying up to 240,000 cubic meters of fresh water per day. According to the article below, 15 countries including China, Indonesia, and Malaysia are already interested in buying the floating nuke plants from Russians. I have a feeling that Russians may not like the title of the article, but here it is, as I do not understand the Russian language. So much for the lessons of Fukushima. Never mind oil spills, the Russian Federation is preparing an energy initiative that, if it has problems, will inject nuclear material into the maritime environment. Baltiysky Zavod is Russia’s biggest shipbuilding complex. According to Voznesenskii, the "Academician Lomonosov" FNPP will be the first vessel belonging to the new line of floating nuclear power plants that can provide energy, heat and water to remote and arid areas of the country, with mass production scheduled for the near future. The "Academician Lomonosov’s" technology is based on the USSR’s construction of nuclear-powered icebreakers. The Russian media is speculating that the FNPPS will first be used in remote areas of the northeastern Arctic Russia and the Far East, as these regions currently suffer from a lack of energy, slowing their development. Each 21,000 ton vessel will have two “modified KLT-40 naval propulsion reactors” that will provide up to 70 megawatts of electricity or 300 megawatts of heat, sufficient for a city with a population of 200,000 people. Additionally, the floating NPPs can provide water desalination services capable of supplying up to 240,000 cubic meters of fresh water per day. Perhaps referring to Soviet-era nuclear icebreakers is not such a hot idea, at least for those with historical memories. Launched in 1957, the Lenin, the USSR’s first nuclear powered icebreaker, was powered by three OK-150 reactors. In February 1965, there was a loss of coolant incident, and some of the fuel elements melted or deformed inside reactor number two. The debris was removed and stored for two years, and subsequently dumped in Tsivolki Bay near Novaia Zemlia two years later. The second accident was a cooling system leak, which occurred in 1967, shortly after refueling. Not a reassuring developing for the Soviet Arctic environment. "Academician Lomonosov’s" keel was laid in April 2007 at the Sevmash shipyard in Severodvinsk on the White Sea, but the project was subsequently transferred to the Baltiskii Zavod. The "Academician Lomonosov’s" 21,500 ton hull was subsequently launched in 2010, although construction work was frozen in mid-2011 because of bankruptcy proceedings against the shipyard. The company was subsequently acquired by state-owned United Shipbuilding Corporation and Rosenergoatom signed a new contract with the Baltiskii Zavod for the "Academician Lomonosov’s" completion. The "Academician Lomonosov" has 69 crew and specialists. Ominously, the "Academician Lomonosov" has no engines, so it needs to be towed. The vessel is equipped with two modified KLT-40 reactors. The Baltiskii Zavod shipyard stressed that The "Academician Lomonosov" and its successors are all designed with a safety margin exceeding all possible threats which makes its nuclear reactors invulnerable to tsunamis and other natural disasters and the ships meet all the requirements of the International Atomic Energy Agency (IAEA) and do not pose a threat to the environment. The factory further states that 15 nations, including China, Indonesia, Malaysia, Algeria, Namibia and Argentina have already expressed interest in buying floating nuclear power plant. The "Academician Lomonosov"will be sent to Vilyuchinsk, Kamchatka for operational testing. Rosatom then aims to construct seven more FNPPs by 2015, with four of them likely to be located on the northern coast of Siberia’s Yakutia. Other Arctic areas provisionally scheduled to receive FNPPs include port cities along the Russian Federation’s arctic coastal Northern Sea Route and Pevek in Chukotka. An added benefit of the FNPP as envisaged in Moscow is that the provision of nuclear power to the Arctic and Far East will free up more oil and natural gas for foreign export, allowing the Russian federation to generate additional hard currency. Tow cables snap, Arctic conditions can be unpredictable, ships sink. As the ocean is the common heritage of humanity, perhaps the international community might evince a tad more interest in this project. Russian Siberia will have 4 floating nuclear power plants. Well, what's the point of not starting Japanese nuke plants? What difference will that make? No one knows from where, or how, but ever since the higher levels of radioactive cesium started to get detected from the groundwater samples in the observation holes along the seawall at the plant 3 days ago (July 8), particularly in the hole No.1-2, TEPCO's explanation up to that point became, obviously, invalid. 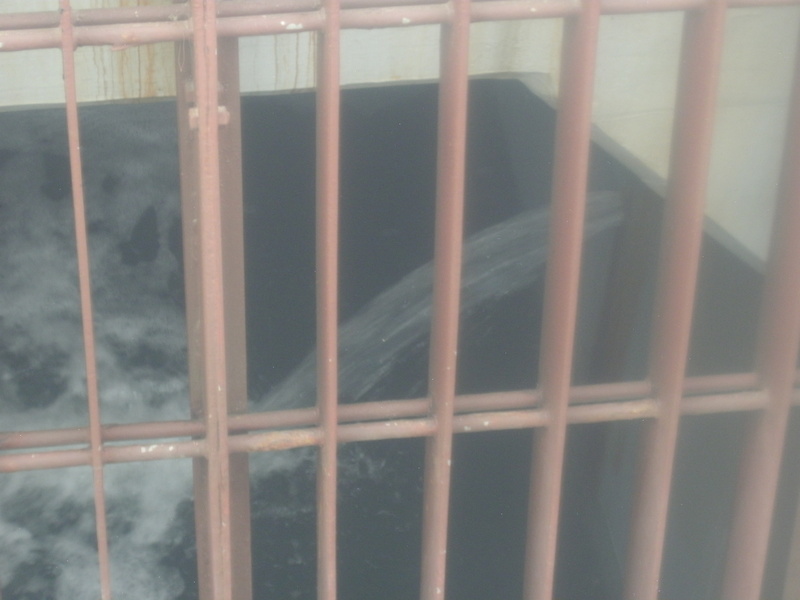 TEPCO had said that the high levels of tritium and all-beta in the groundwater samples were from the extremely highly contaminated water that leaked from a crack near the Reactor 2 water intake in early April of 2011, and that the soil had absorbed radioactive cesium and that was why the water samples were showing very low levels of radioactive cesium. That explanation went out the door when 9,000 Bq/liter of cesium-134 and 18,000 Bq/liter of cesium-137 were detected from the hole No.1-2. But now, TEPCO has come up with the new explanation: It is the dirt particles in the water that are highly radioactive with cesium, not the water itself. To prove it, TEPCO filtered the water using 0.45μm filter, and measured the radioactivity. Lo and behold! The numbers for cesium went down, to 1/100 of the numbers before filtration! Sigh of relief at TEPCO, no doubt. That still doesn't explain the high levels of tritium and all-beta. The plan is still on, by the way, to release groundwater that is being pumped into tanks upstream to the ocean. TEPCO/government is still trying to obtain consent from the fishery association of Fukushima Prefecture. Some of local fishermen are saying, according to Tokyo Shinbun, that it doesn't matter anyway, as no one will buy fish caught off the coast of Fukushima anyway. Once Abe and his minister in charge of countering baseless rumors (aka radioactive materials) have their way after the Upper House election, the fishermen will get to sell their catch, I'm sure. Japanese Upper House Election: PM Abe "I'm Healthy Because I Eat Fukushima Rice, and LDP/Komei Stable Majority Will Result in Proud Japan"
After re-reading what Mr. Masao Yoshida said last year and thinking about what he and his men had to go through at Fukushima I Nuclear Power Plant after March 11, 2011, it is almost revolting to relate to you what the current prime minister of Japan is saying to win the election for the LDP candidates. Prime Minister Abe, whose party is set to win a landslide in the coming Upper House election (on July 21), has been going all over Japan to give campaign speeches for LDP candidates, probably inhaling oxygen regularly. Here are two gems from the recent Abe's utterance. First, from his July 4 appearance in Iwaki City in Fukushima Prefecture in support of LDP's Masako Mori, the minister in charge of consumer affairs and increasing the number of children in Japan who has declared all-out war to eradicate "baseless rumors" to help farmers in Fukushima Prefecture by forcing retailers to carry Fukushima produce. She is from Fukushima Prefecture, naturally. We have something we should deal with. And that's baseless rumors. There are baseless rumors, unfortunately, and delicious Fukushima produce can only get low prices or it is hard to sell them. Countries still do not allow import of Fukushima produce from Japan. We will change that. Today, I am speaking to you full of vigor and health. Why am I so full of vigor and health? To tell you the truth, it's because I eat rice from Fukushima at my official residence everyday for lunch. When I meet foreign leaders at summit meetings, I tell them, "I am eating rice from Fukushima". I am saying that. I will eradicate baseless rumors completely, accelerate [the buildup of] infrastructure, and do my best for the recovery of Fukushima. And above all, I will protect the health of children in Fukushima at all cost, together with Ms. Mori. And that is my promise. Then on July 8 in Narashino City in Chiba Prefecture, Mr. Abe equates the LDP majority in the Upper House (and the coalition majority already in the Lower Hosue) to "proud Japan", one of his buzz words he thinks will inspire the Japanese. So, winning the stable majority by LDP and Komei will make Japan proud. Such nonsense, such light-weight. "Stable majority" means LDP and Komei Party win enough seats in the coming election (half of Upper House is up for election, 122 seats) so that their overall seats are 129. A simple majority is 123. Winning the stable majority in the Upper House means the ruling coalition will rule more than half of the 17 standing committees. LDP/Komei is expected to easily pass 123 seats. Currently the two parties hold 102 seats (LDP 83, Komei 19). An Asahi Shinbun's China correspondent sadly observed in a recent ASEAN meeting in Brunei that Japan was becoming irrelevant to the world politicians, as he related the Chinese foreign minister having a casual and friendly chat with the US NSC Asia Division director, with both speaking in fluent Japanese. Japanese foreign minister didn't talk to anyone other than at official meetings, and no one sought him out for a chat or any kind of informal talk. Japanese foreign minister couldn't even talk to the US counterpart, Secretary John Kerry. I guess they don't want to hear about baseless rumors and Fukushima rice. For those Japanese citizens who are highly critical of secular Egyptians wanting none of the Islamic president (who seem to be the majority in Japan), citing "rule of law" and "democracy", when the LDP/Komei landslide happens in about 10 days, it will be their chance to follow their own advice and fully support LDP and Mr. Abe and their policies, to show the world how rule of law and democracy should work. Japanese are in their own bubble, politicians and citizens alike, as not even the triple meltdown of nuclear reactors woke them up. LA Times: "Without San Onofre, San Diego and south O.C. power could be tight"
LA Times article also quotes a state Democratic senator saying challenging times ahead for carbon emission reduction because of San Onofre closure. The energy landscape of Southern California will look vastly different without San Onofre, officials said in a state Senate committee hearing Wednesday, the first in a series of public discussions on life without the nuclear plant. The 2,200-megawatt behemoth in northern San Diego County brought a steady supply of power to about 1.4 million homes until equipment problems forced it to close in early 2012. But the plant's owner, Southern California Edison, announced last month that it would be permanently retired. The plant's closure came as the state was dealing with new regulations on the use of ocean water for cooling that will force many coastal plants to shut down or perform extensive upgrades, and a mandate for the state to get 33% of its power from renewable resources by 2020. In the short term, officials said California should get by this summer without San Onofre, although energy supplies will be tight in San Diego County and southern Orange County if there is an extreme heat wave or fires that take out transmission lines. Three new gas-fired plants in Southern California — El Segundo, Walnut Creek and Sentinel — will "only help marginally" in the San Diego and Orange County region that depended most on San Onofre, said Steve Berberich, chief executive of the California Independent System Operator, which oversees much of the state's grid. A more helpful development was the conversion of two retired gas-fired units in Huntington Beach into "synchronous condensers," pieces of equipment that help move energy through the grid so that more power can be imported from outside the region. The long-term plan for replacing San Onofre is still far from complete. What is clear is that the future grid will need to be more decentralized and flexible, officials said. Some voiced concerns that the loss of San Onofre will lead to an increase in reliance on fossil fuels, at least in the short term. “One of the challenges we have with the closure of San Onfore is that nuclear helps us with our greenhouse gas emissions," said state Sen. Fran Pavley (D-Agoura Hills). Increasing the use of renewables does not entirely solve that problem, officials said, because until better technology is developed for energy storage, the energy they produce is not available at all times. “You have to fill that in when the wind doesn’t blow and the sun doesn’t shine, and right now the technology available to do that is the gas plants," Berberich said. A task force of various state energy and environmental agencies is working together to come up with a long-term plan for replacing San Onofre, and is expected to come back with recommendations by mid-September. State Sen. Alex Padilla (D-Pacoima) said he was encouraged to see the various state energy agencies working together. But he also pointed out that officials would not be scrambling now if they had planned before the plant went down for the possibility of San Onofre going offline. "The public deserves to know whether or not the regulators in California and the legislators in California are on top of the challenge of keeping the lights on," he said. Japan's Nuclear Regulatory Authority: "We will need a long time to change safety culture" but "We will restart some reactors in one year"
NRA Chairman Shunichi Tanaka has no problem, actually he is extremely proud and confident, in executing the new, world-toughest regulatory standards for the nuclear power plants in Japan which he and his group of scientists and industry advisors and bureaucrats came up with in less than 6 months. For their defense, they had no choice, as the law that created the Nuclear Regulatory Authority in September 2012 specified that the NRA come up with the new standards within 10 months. The 80-strong inspection members in 4 groups (3 groups for inspecting the facilities, one group specializing in earthquakes and tsunami assessment) are confident they can finish inspection of the physical plants, after they pour over thousands of pages of each application for restart (there have been 10 so far, and four more to come) in 6-month time. (Reuters) - Japan's nuclear regulator said on Thursday that elevating safety culture to international standards will "take a long time", days before new rules come into effect to avoid a repeat of the Fukushima nuclear disaster in March 2011. An earthquake and tsunami killed nearly 20,000 people and triggered the world's worst nuclear crisis in 25 years when the Fukushima-Daiichi nuclear plant was destroyed, leaking radiation into the sea and air. The Nuclear Regulation Authority admitted that the awareness of the dangers related to working with nuclear technology had been weak prior to the disaster and that it hoped new standards would force the companies to change their approach. "The new regulations include extremely stringent requirements that the operators would not be able to endure if they don't change their culture," authority chairman Shunichi Tanaka told reporters. "We will need a long time to change this culture, but day-to-day efforts to meet those tough standards will in the end lead to the improvement in the safety culture." Tokyo Electric Power Co, operator of the Fukushima plant that had three meltdowns, Kansai Electric Power Co and three other listed nuclear operators have said they will apply for restarts after the rules go into effect. Tanaka declined to comment on whether he considered Tokyo Electric - still struggling to contain leaks and power cuts at its ravaged plant - fit to operate nuclear facilities. He added that whether the company will be given a green light would depend on the contents of its application. Only two of Japan's 50 reactors are running and the decision by the previous government to start them up last year was met with the biggest protests in decades and contributed to its defeat in polls in December. According to an Asahi newspaper poll in June, 59 percent of respondents were opposed to the new government's plans to use nuclear power to help turn the economy around. Without reactors running, the utilities have been forced to turn to fossil fuels instead, especially costly liquefied natural gas (LNG). The fall in the value of the yen means they face a fuel import bill of 3.8 trillion yen this business year, double the year before the Fukushima disaster, according to a recent government study. Upgrades the Nuclear Regulation Authority requires in its quest to impose the world's toughest earthquake and tsunami standards will cost the industry an estimated $12 billion, according to Tom O'Sullivan, an independent energy analyst based in Tokyo. Tanaka stressed that the new regulator had what it took to impose the new regulations. "We have large authority and powers. If the operator does not comply with our regulations, they won't be able to operate, let alone restart their reactors," he said. Well, judging from the very fact that the operators of 10 reactors were able to submit applications that run thousands of pages on the very first day under the new regulatory standards, the "extremely stringent requirements that the operators would not be able to endure if they don't change their culture" may not be that stringent after all. So, the Japanese way to develop "safety culture" is to hastily come up with new regulatory standards, hastily enforce it, hastily accept applications, hastily inspect the plants, hastily restart the plants that passed the hasty inspection based on the hastily crafted regulatory standard, and see what happens and hope no accident happens in the lifetime of the stakeholders. "Some units are projected (to restart) one year from now, though I don't know how many," Kenzo Oshima, a commissioner of Japan's Nuclear Regulation Authority, told Reuters. "It is hard to imagine that all the applications would be rejected, though we don't know what the outcome will be at the moment." Kenzo Oshima is the only commissioner in the Nuclear Regulatory Authority who is not a scientist. He was a career bureaucrat at the Ministry of Foreign Affairs. I occasionally listen to the live netcast of NRA's press conference, and when I do I am often impressed with questions from the Japanese reporters working for foreign news agencies like Reuters, AP, New York Times, etc. They ask tough questions, and they do not easily give up, because they have articles to write for tougher audience. Masao Yoshida (age 58), who was the plant manager at Fukushima I Nuclear Power Plant, died in the morning of July 9. Sources at TEPCO revealed the news to Mainichi. While he was the plant manager in March 2011, the Great East Japan Earthquake and the nuclear accident happened. He led the accident response at the plant. He left the post in December 2011. He underwent an emergency surgery in July 2012 for cerebral hemorrhage. Jiji Tsushin says the cause of death was the cancer of the esophagus. In the first and the only interview he gave was right before the emergency brain surgery. He said he saw divine beings in the workers, who would go out and do the work in a hellish situation, come back and go out again. He said he would like to spend his time speaking for the workers. He did not get the chance. He must have had so much he wanted to say. He has now joined the divine beings. May he rest in peace. For those of you who haven't read them, here are my posts from August 2012, on his interview on July 10, 2012, right before he fell ill.
(Part 2 of 2) Video Interview Transcript of Former Plant Manager of #Fukushima I Nuke Plant Masao Yoshida: "We Put the Names of Workers on the Whiteboard, As a Grave Marker"
Following the part 1 , here's the part 2 of the video transcript of Mr. Masao Yoshida, former plant manager of Fukushima I Nuclear Power Plant. Again, the occasion was a small symposium in Fukushima on August 11, 2012, and Mr. Yoshida's video interview was done in July, before he had cerebral hemorrhage. The transcript is from Mainichi Shinbun article (8/11/2012), not from the video which only 140 or so people who attended the seminar got to watch. Workers relied on you as their mental [emotional] support. I didn't do anything. All I can say is that I have worked at Fukushima I Nuclear Power Plant on 4 different appointments. I know almost all [TEPCO] workers at the plant, and I know many in the affiliate companies. I know their names. "Mr. so-and-so, are you alright?" That was it. I asked them. That's all I did. I couldn't do anything. Everyone else did it. That's how I still feel. You mean you took time to communicate with them? Yes. We know each other. We've been working together for a long time, we're colleagues [we've been in this together]. I watched these colleagues of mine go to the horrendous scene of the accident at the plant, come back, and go back out again. All I could do was to bow my head [and thank them]. Did you think you would die when Reactor 3 blew up? In addition to Reactor 1 ['s explosion], Reactor 3's explosion made the strongest impact [on me]. In retrospect it was a hydrogen explosion, but at that time we didn't know what was happening. I thought something catastrophic had happened. About the explosions. I could die, and all people in the Anti-Seismic Building could die, at any moment. It was particularly so after the explosion at Reactor 3. That much debris flying all over. When I first heard that several people were missing, safety of tens of people was not confirmed yet. I thought, maybe more than 10 people just died. Then, more information started to come in, confirming the safety of people, though there were some with minor injuries. And I feel very sorry for the Self Defense Force. The SDF troop came to supply water and they were caught in the explosion and were injured. I am very sorry. One consolation is that injuries were not life-threatening, and I feel as if it was some kind of divine providence. You instructed your people to write down the names of the members who remained in the plant on the whiteboard. What were you thinking? I hardly remember how it was, but probably I just wanted to show what kind of people remained and fought till the bitter end. In retrospect. I don't know myself, really. You thought it would serve as a grave marker. This event [Mr. Yoshida uses an industry term for this accident] has been discussed and written up by the investigation commissions by the Diet, Cabinet Office, and the private foundation. We [at TEPCO] have thoroughly discussed with the Cabinet Office investigation commission in particular. There are many inquiries from the mass media, but we have said all to these commissions [TEPCO wasn't interviewed by the private commission] so I think it is enough for the media to go from there. But it is hard to have our true voice heard. Our true voice does not come across through the [reports of the] investigation commissions. For that part, I think we should spread the message in various ways. Not just my experience, but the experience of my colleagues who worked at the plant together, I would like to tell properly. How should Fukushima I Nuke Plant and Fukushima Prefecture be, from now on? That's a high-level question, and I don't have a ready answer for that. But it comes down to how to make the plant stabilized in a proper way. We cannot have the residents [in the surrounding areas] come back home while this is not accomplished, so it is the largest (task). What's needed most, as I was also saying during the accident, is to make Fukushima I Nuke Plant more stabilized, using the knowledge and expertise not just in Japan but in the world. We should properly assign responsibility [for the accident] on people, but what's most important is to make the plant as stable as possible. We need people for that, we need technologies and new ideas. I think it is important to focus [on the stabilization of the plant]. Only then we can decide whether the local residents can return to their normal lives. In any way, the most important task is to calm down, stabilize the situation at the plant. I still don't have enough strength, but when I come back [from illness] I want to do all I can for the plant that way [i.e. making the plant more stable]. Yoshida says they need to stabilize the plant. That means the plant is not stable, as of now. Therefore, the plant is unstable, in danger. All Mr. Yoshida said was the plant needs to be made more stable, in a proper way - replacing Kanaflex hoses would be one, removing the debris and clutter would be another - so that the plant's various operations can run in a smooth, predictable manner, with no accidents like small fires and water leaks, not to mention major accidents. By the way, this "Yoshida said the plant is not stable" duly came back to Japan as a credible piece of news in English, but it quickly disappeared among more sensational headlines (like butterfly mutation due to Fukushima radiation, for one). From the sample taken on July 5 from the hole (No.1-2), 99 Bq/liter of cesium-134 and 210 Bq/liter of cesium-137 were detected, along with 900,000 Bq/liter all beta and 380,000 Bq/liter tritium. According to Kyodo News, the observation hole No.1-2 is close to the hole where extremely highly contaminated water was found gushing from a crack in the wall into the ocean in early April in 2011. Back then, the radiation level above the water was so high that the survey meter went overscale; it was at least 1,000 millisieverts/hour, or 1 sievert/hour radiation at at least 1 meter off the surface of the water. I don't think TEPCO ever bothered to measure radiation levels outside the Containment Vessels if they were over 1 sievert/hour. I couldn't find the numbers for radioactive cesium. After bath salts, sawdust, shredded newspapers, baby diaper polymer (sorry, links to images are gone), concrete mix, that water finally stopped when special polymer was injected into the base rock beneath the culvert (duct) that was carrying the contaminated water. At that time, I wrote, "OK. So the water is going elsewhere." TEPCO says they plan to inject similar polymer along the ocean side of the turbine buildings to stop the contaminated water from reaching the ocean. The water may go elsewhere. TEPCO continues to say they still don't know whether the two are related. The water sample from the same observation hole, No.1-1, was found with 3,000 Bq/liter of all-beta (including strontium) on June 29, 2013. The successive measurements showed higher all-beta from the same hole. Here's the latest number of all-beta and tritium for the hole No.1-1, and the hole No.1-2, which they dug after detecting high all-beta in No.1-1. The sample from the hole No.1-1 has high tritium (600,000 Bq/liter), but take a look at the sample from the hole No.1-2. It has extremely high amount of all-beta, at 900,000 Bq/liter. The sample also have higher amounts of cesium and other gamma nuclides compared to the sample from the hole No.1-1. Just yesterday (July 6. 2013), Jiji Tsushin reported that the seawater sample collected on July 3 at the water intake for the Reactors 1-4 at Fukushima I Nuclear Power Plant was found with the highest amount of tritium since the accident, at 2,300 Bq/liter. However, according to TEPCO, it still can't be determined whether the contaminated groundwater with high tritium content is leaking into the harbor.